A Week in the Woods by Andrew Clements is about a boy that learns about the woods throughout many misadventures. The main character, Mark, is the son of two parents that are possibly some of the richest people in America. The family needs to move to New Hampshire to be closer to work, but because the parents are always so busy, Mark is usually alone with his two babysitters. In the story, Mark goes to school a new school and learns about the school field trip, A Week In The Woods. At first he is skeptical, but decides to give the trip a chance. When arriving, he immediately gets in trouble for a knife that isn’t his. When his teacher realizes that the knife isn’t his, he goes to get Mark but Mark is gone. The teacher chases Mark through the woods and the two are confronted by different problems. One of these was when the main character starts to get lost in the woods after he makes mistakes, like not consulting the map. The other problem was when the teacher said “his face was as pale as a full moon and twisted by pain, his lips purple. It’s my . . . ankle”. This character had twisted his ankle when looking for Mark. These are examples of the suspense that the readers are enraptured in. My thoughts on this book were mostly high. 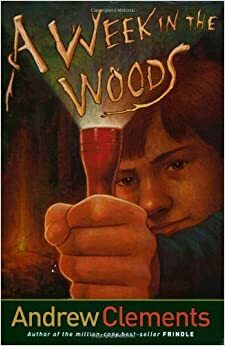 Other than some things that seemed unrealistic, like an inexperienced boy living in the woods for a day and a night, and that the child would even go into the woods after getting in trouble, I enjoyed reading the book because it had suspense and nature in it. I would suggest this book for anyone who enjoys the outdoors and good stories. I would also suggest this book for anyone who is between the age of nine and thirteen, and Because this is a good book, I would suggest it for anyone who likes books and reading.